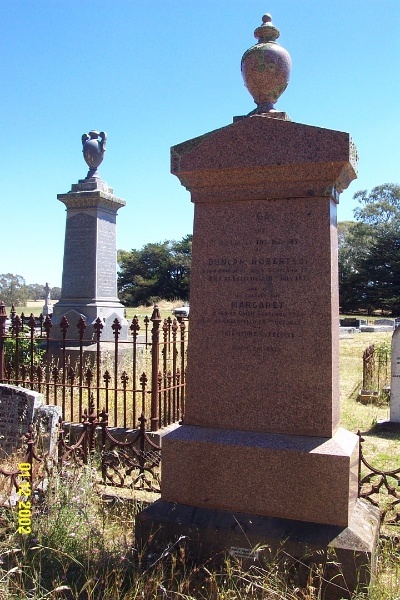 The Balmoral Public Cemetery is located in a two hectare reserve surrounded by farmland. 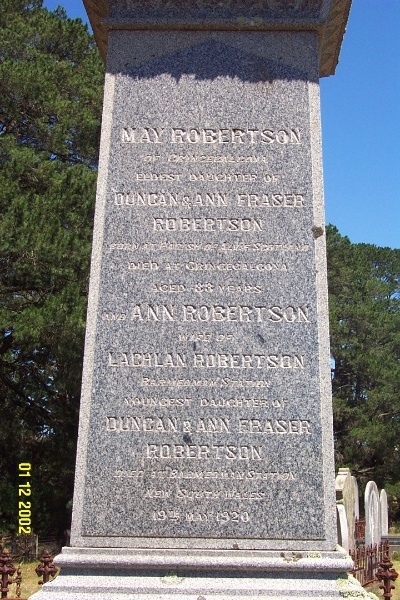 It is located at the extreme southern end of Cemetery Lane, approximately six kilometers to the south of the township of Balmoral. 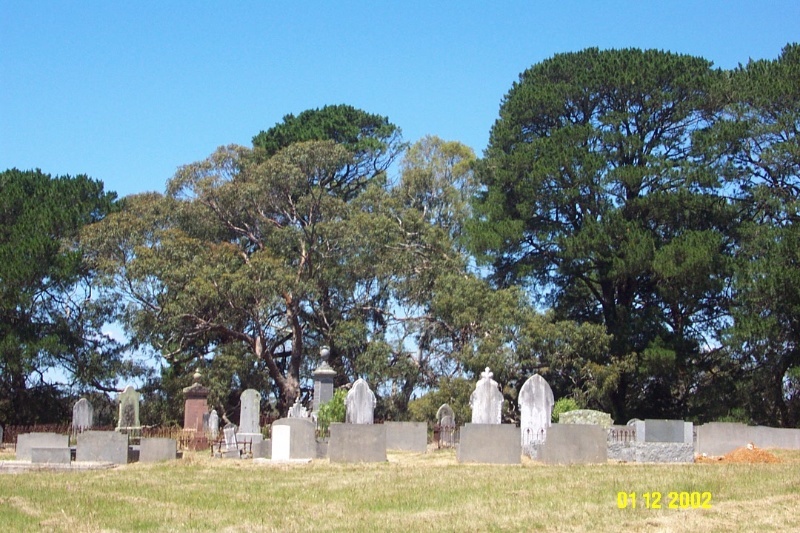 It is Balmoral's only public cemetery, although several large pastoral runs in the area (which date from the 1840s) have private burial grounds associated with them. Burials date from the early 1870s and continue to the present. The layout is typical of a simple nineteenth century cemetery, set on a gentle rise with a heavy perimeter planting of Cupressus macrocarpa (Monterey cypress) and Pinus radiata (Monterey Pine) defining the reserve, and evoking an atmosphere of dignity and repose. The graves are approached through a simple late nineteenth century gate, marked by two Cupressus macrocarpa 'Aurea'. On either side of the gate, the remains of the original post and rail fence survive, although most has been replaced by a conventional six-wire fence. The graves are laid out in typical denominational fashion. The Cemetery is in good condition generally, and retains an high degree of integrity. 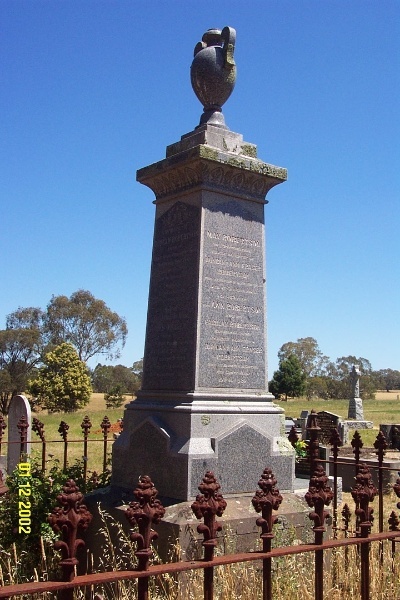 The Balmoral Cemetery is of historical and social and architectural significance to the township of Balmoral and the Southern Grampians Shire. 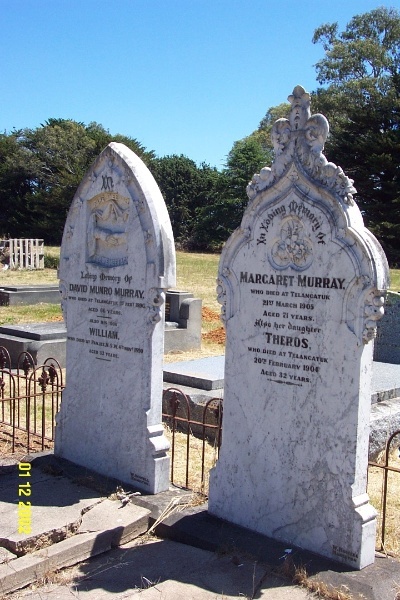 The Balmoral Cemetery is of historical significance as an enduring record of those who have lived and died in the community, as a reflection of passing phases, ways of life and death, particular events, and as documentary evidence. 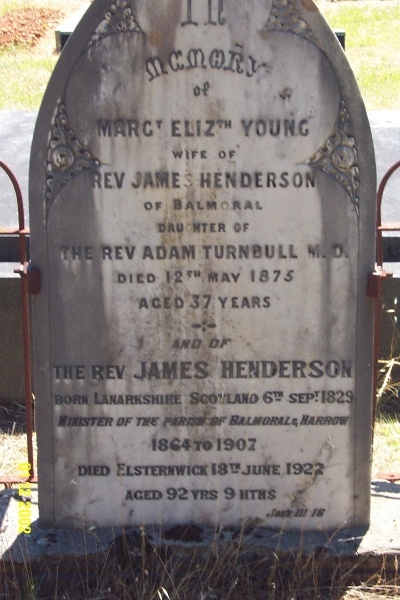 The Balmoral Cemetery is of social significance for reflecting the customs and tastes of the community, for reflecting different religious values, and for reflecting different economic and social status. It is also important as a place of passive recreation. The Balmoral Cemetery is of architectural significance for its range of tombstones, memorials and iconography reflecting the aesthetics of different periods and groups within the community. The planting of Cupressus and Pinus species enhances the funereal aesthetic of the location. The cemetery is in very good condition, with no gravestones vandalised. Most of the gravestones are well maintained, as are the fences and plots. 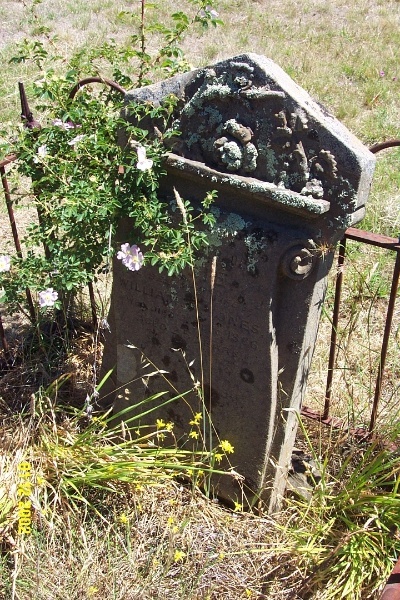 The Balmoral Cemetery is located at the extreme southern end of Cemetery Road, between the Coleraine -Balmoral road and the Natimuk Hamilton Road, some seven kilometers south of the township of Balmoral. 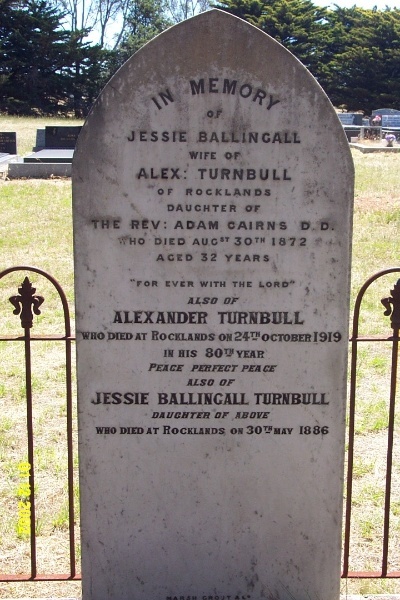 The Cemetery is sited on a gentle rise overlooking a tributary creek of the Glenelg River. The gravestones are enclosed in a roughly square reserve of approximately 2 hectares, the perimeter of which is defined through plantings of Cupressus macrocarpa (Monterey Cypress) and Pinus radiata (Monterey Pine). A gate is set into the perimeter planting, the entry emphasised by two specimens of Cupressus macrocarpa 'Aurea'. On either side of the late nineteenth century gate are the remnants of the original post and rail fence. The graves are grouped in the conventional manner. According to denominations. There are no structures on the site, although a number of graves have small memorial plantings on them. 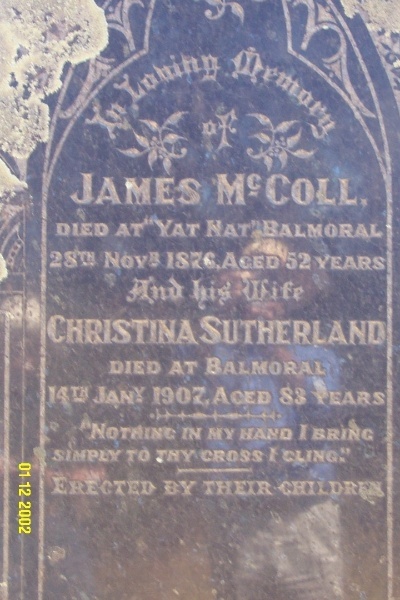 The graves of many families who made important contributions to the development of the Balmoral community are located in the cemetery.